This collection is now sold-out for ever. Thank you to those that were able to get theirs before they were gone. 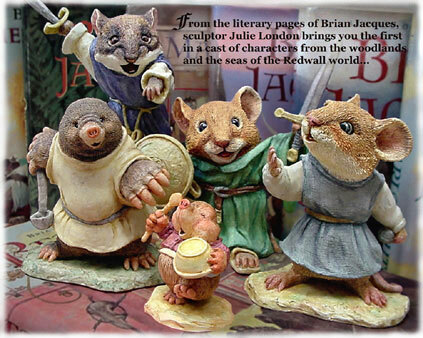 Julie London worked on this series of with the approval of Brian Jacques, who enjoyed the figurines. She made the original sculptures in clay at Second Story Studios. A silicon mold was made from the original sculpture, and a replica is cast from that silicon mold. London then hand painted the first replica to determine the overall look of the colors. Once satisfied with the overall look, a painted prototype was sent on to the U.K., where the production of each replica was overseen. 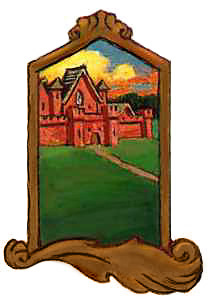 The Redwall inspired sculptures were produced in an old world tradition. Each replica has been hand-cast and meticulously hand painted in oils. Each sculpture is a limited edition worldwide. To order a COMPLETE SET of these rare and timeless pieces of art, fill out the form below and you will have your very own RARE collectible set.